Try turkey instead. Sometimes I get a hankering for something hearty and filling for dinner after a long day at work. One night I was seriously craving a big juicy burger. So I stopped at the market after work and bought some ground turkey. 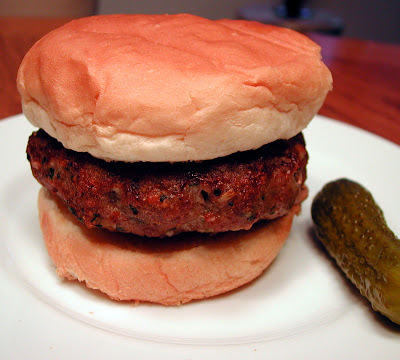 It is healthier than ground beef with less saturated fat and I just love it. I actually prefer it to beef now. I wanted to flavor it with some fresh herbs, I was thinking the usual; basil or parsley. But when I went to grab a pack of basil, the fresh tarragon caught my eye. So I went with that instead. I thought it would really freshen and brighten the flavor of the burger. And it did. It is such a fresh flavor; it tastes a little like fennel to me. Kind of like licorice, only not as strong. Delicious! Mix together egg white, garlic, tarragon, parmigiano cheese, salt, pepper and breadcrumbs in a medium bowl. Add the ground turkey and mix until evenly blended. (Do not over work the meat or it will be tough when cooked). Form into 4 equal size patties. Broil burgers about 6 inches from element for about 5-6 minutes per side or until no longer pink in the center. (180 degrees on an instant read thermometer). Place each burger atop a toasted bun. Top with a slice of fresh tomato if desired.